If you were like me, you spent many years developing classic Notes applications before making the switch to XPages. If this was the case, you were no doubt comfortable with the notion of a RichText field. You probably even occasionally did some RichText manipulation in LotusScript, adding Paragraphs and formatting using RichTextStyles and RichTextNavigators, attaching Files using EmbeddedObjects. And then later on, you come along and write an agent or a function that is meant to deal with a RichText Item and you don’t know why it doesn’t work and why everything looks funny after you do it, and it all comes down to the difference between RichText and MIME but you didn’t even realise there was a difference. If you can understand some core principles of this Mime / Rich Text ecosystem, then you will be on a much better footing to solve the problems which inevitably appear whenever you are getting involved with Mime / Rich Text creating and manipulation. I think one origin of confusion is that the phrase ‘Rich Text’ is often used to describe more than one thing. To demonstrate what I mean, let’s think about ‘Audio files’. Imagine you are a programmer and your problem is that you need to record and playback some sound. Well what file format do you use? Maybe you decide to come up with your own format like Microsoft did e.g. Windows Media Audio (.wma) or alternatively, maybe you decide to use a format that everybody else uses e.g. MPEG layer-3 (.mp3). The end result for both these ‘Audio Files’ is that you hear sound coming out your speaker just the same, but they are store in different underlying formats. Additionally, if I talk to you about the above situation and I say the word ‘Audio File‘, you know that I am talking about the CONCEPT of an audio file, not any specific format. In comparison, IBM came up with there own way to save ‘Pretty words, pictures and files’, and the rest of the world came up with another way ‘MIME’, but in Notes/Domino we tend use the word RichText to describe both the CONCEPT of ‘Pretty words, pictures and files’ and also we use RichText to describe the specific format IBM created to store these items. So you can see the confusion here, someone says “I am storing it as RichText” well what do you mean? are you talking about the format or the concept??? When they first invented email, RFC822 was the standard which defined how a computer could send a text message to another. This was great, but then people wanted to send messages with using different character sets, they wanted to include images and attachments (Look how excited Steve Ballmer is about putting a picture of a Ferrari in a ‘Microsoft Write’ document). So MIME was invented, which was a new standard of transferring this more complicated information over the same RFC822 compliant system. In a crude nutshell, a MIME message is just a big long text string/file, which is formatted in a precise way in accordance to the MIME standard. The Wikipedia article on MIME is a good overview, but if you are ever in doubt about exactly how it works, read the RFC’s that are linked there as these are from the horse’s mouth and they form the actual standard that software would hopefully adhere to. Let’s have a quick look at a MIME message. 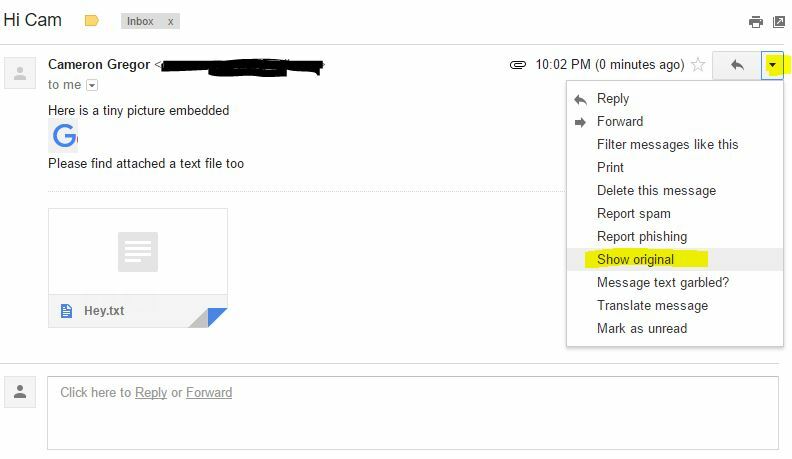 Many email clients / webmail clients will have some way for you to inspect the original ‘MIME’ version of your email. 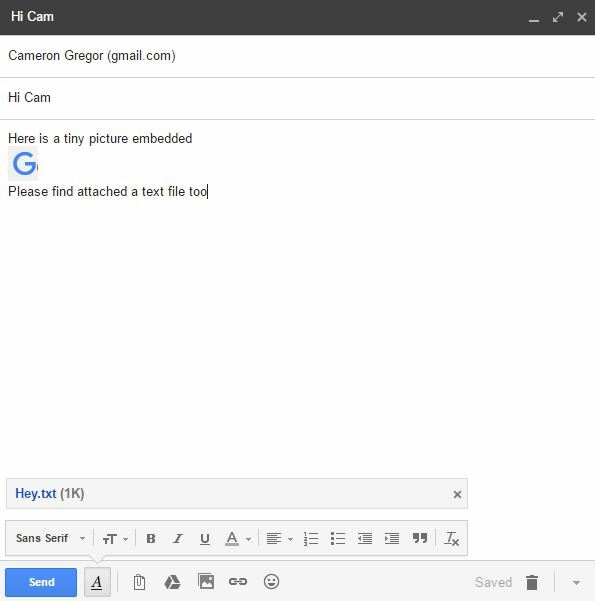 To demonstrate, I will send myself an Email in Gmail and have a look. Here is a draft Email that I am sending myself, it has an embedded Image, and it also has an Attachment. So now I send the email to myself, and when I open it in Gmail, I can choose option to ‘Show Original’. So you can see it is like a big long text file, but hidden in all that is my image, my attachment, my Html message (and also a plain text version so that anyone on an old school messaging client can also read it). The Message Starts with some SMTP headers which help understand how the message came to be in our inbox! If you are sending receiving MIME in domino, this header information will not be stored in the Body ‘RichTextItem’ but is usually stored as separate items on the Document, e.g. the ‘Subject’ item, SendTo etc. So the Mime Part starts with a ‘Content-Type’ Header which describes the purpose of this mime part, in our case it is saying ‘Please treat this as Html’, it also says that our charset is UTF-8. Then it has the blank line which indicates we are finished with headers, and now comes the content. The content then begins and you can see the Html content of our email message. 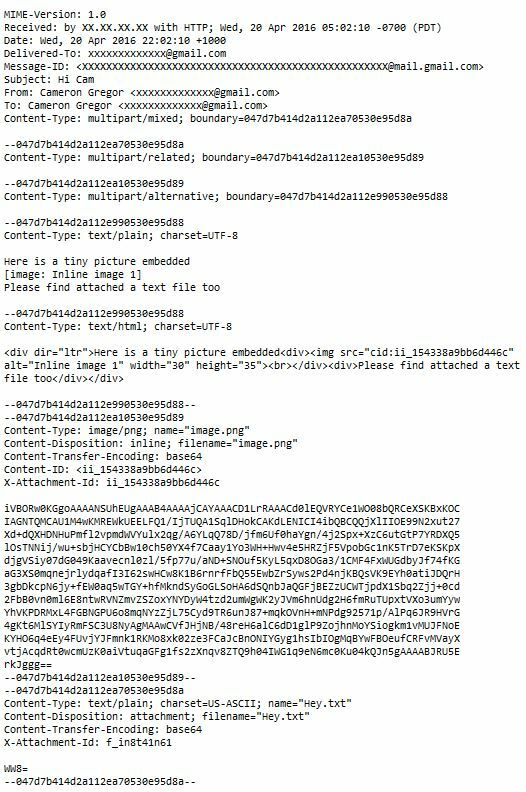 It then has the blank line, and then the content, which is just the image data in a base64 encoded string. So we have seen 2 simple MIME Parts, but for a complicated message it also needs to be specified how all our Mime parts fit together, and this is usually done by using the ‘multipart’ mime types. Multipart content types are special parts which contain child mime parts. Multipart types must specify a ‘Boundary’. The boundary is just a text string that is used as a marker to signify when each Child MIME Part begins and ends. This boundary could be anything you like, however if you were to choose a boundary that might also appear in the content, there might be a clash, so the boundary is usually some type of garbled text that is unlikely to appear in a content block. 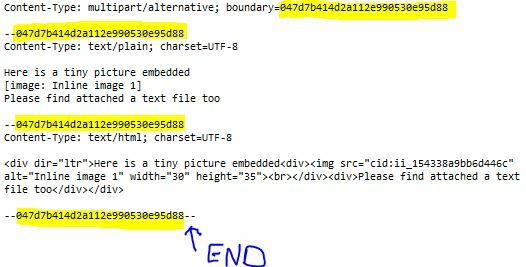 So we can see at the start, the multipart/alternative says “I will use 047d7b414d2a112e990530e95d88 as the boundary, and we can see it has used this boundary to define the start and end of the 2 child mime parts (text/plain and text/html) which are to be treated as ‘alternatives’ i.e. you could read one or the other. Note also, the very last boundary must have 2 hypens at the end. But, what you would actually get is the just the first MimeEntity (in our case the multipart/mixed part). You would then have to traverse through child/sibling to do what you want to do. This topic warrants another post so I won’t go into depth right now. IMPORTANT NOTE: If you wish to do some MIME processing on a document you must tell your NotesSession NOT to convert MIME to RichText when it opens a document. This must be done before you retrieve your document. e.g. If you don’t do this, it will look to you as if the MIME was actually stored as RichText (the format) but what is really happened is that Notes is doing a sneaky conversion when you open the document. This is a NotesSession-wide setting, so it is good practice to check what this setting was before you modify it. That way you can set it back to what it was before you changed it. e.g. One last point, is that if you do any manipulation of MIME Entities (we will cover in another post), when you are finished you should use the closeMIMEEntities method to tell the document you are finished mucking around. This method has a ‘saveChanges’ parameter which indicates whether you want to keep what you have done, or discard whatever you were doing with MIMEEntities. By default it is ‘false’ or discard. This ‘savechanges’ is an in-memory process, e.g. it just means apply the changes to the document you have open. You still need to save the document to make the changes permanent. I feel MIME is one of those things that is complicated and simple at the same time. Whenever I have to solve some MIME related problem, I know the answer will be simple, it is usually one line of code in the wrong place, or one bad MIME part header. But, the steps involved to debug that ONE change, are often complicated, and require a good understanding of what is actually going on both in MIME-land and in Domino-land. I hope this post has helped clarify at least some of it for you, please let me know if you have any questions (or if I have made a mistake somewhere)! Cameron, Thank you for your bost about MIME. It realy helps a lot. Have you ever had problems when converting a MIME program to Domino API. Does Domino API deal with MIME/RTF in a different way? Thanks for the Comment Marcelo! When you say ‘Domino API’, do you mean the OpenNTF Domino API? Hi Marcelo, Sorry I forgot to reply to your follow-up comment, no I haven’t done any work with the OpenNTF Domino API yet so I don’t have any experience with that sorry! Speaking about MIME and RTF’s..
I’ve got a case where I want to Copy an email Body (which contains attachments and sometimes tables containing attachments) from Notes and then Paste the clipboard contents into an inputRichText field in my xsp. Do you know of a technique? I’m getting my first taste of working with MIME in an xpages project. I was wondering what the follow-on article was called; you’d mentioned it was due. Manipulating MIME or something like that? Cameron Gregor © 2019. All Rights Reserved.